This is the second (or third – not sure?!) and final post about my recent fascination with schemas! I love reading blogs for different ideas and perspectives on topics and I just thought I’d share mine. I’m also really pleased with myself for finally putting this in a handy and organised list that I can refer to later! I’m not a huge fan of the word schema or what it represents. Your children will do a heap of inexplicable random things and sometimes you can’t quantify that in a neat label or a pre-designated category to tick off. What does it matter?! Just embrace it and go with the flow, unstructured play is the best in my opinion! Today I watched Loki sit on the kitchen floor turning a whisk, he’d rooted out of the utensil drawer, over and over in his hands and fingers and I swear the only reason he was doing so was because it was shiny. It caught his eye and his belligerent magpie senses made him cling onto it. 2 hours later and he was still holding onto the whisk. He’s wasn’t crying, he was extremely content so I left him to it. It was even present during a nappy change! I’m not fighting this one, there’s no need. If Loki wants the whisk, then he can have the whisk. I pick my battles carefully and this morning his wee smug face won! This is a great one for messy play or baking. Mixing flour and egg make a paste or pasta, dirt and water make mud, two different paints together to make a new colour etc. This is fun for everyone frankly! We do a lot of this at the weekend when Mark is home and I have an extra pair of hands. Messy play, sensory play, arts and crafts, baking; so many options. My goal for next spring is to make an area in the garden for him. My friend Clare made this beautiful mud kitchen and it’s simply genius! You can read all about it in her blog post here and find more gorgeous pics on her IG here! Lining up Toys, turning everything upside down, turning everything the right way round, putting stuff into seemingly random yet deliberate order. Loki is a big fan of lining up all his toys, so is Edward. Quite often they’ll line up the Holztiger figures and make sure they all face the right way. Last week Loki stacked all his Grapat in front of the mirror in a big long line. While I have a shower my muff fluff often gets lined up end to end on the bathroom floor. 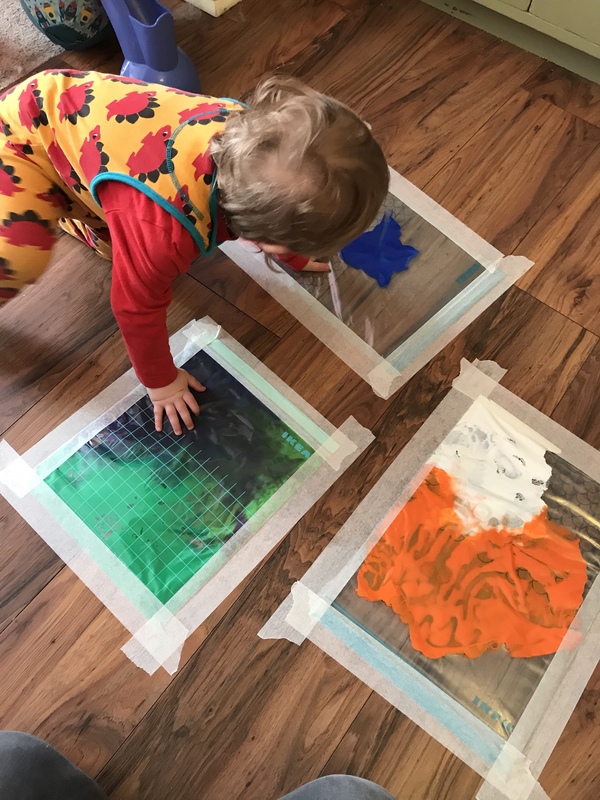 It keeps him quiet and it’s great to encourage or introduce colour matching/sorting, arranging things in terms of size, shape etc. Lots of play potential. A spot of things into things too with a wet bag or two! Edward and Oren often make huge long lines of train track leading from room to room. It would appear they don’t grow out of this phase as quick as the others! Lego. It’s simply amazing. Great for muscle strength and the same Duplo set we were gifted for Edward is still going strong for Loki nearly 8 years on. My house is unashamedly full of Lego and I love it. It’s a truly versatile toy, stacked full of potential. Duplo is nice and chunky for Loki, great for increasing muscle strength and coordination and building up understanding of the concept of connectivity. Loki has a box in the front room and he’ll build small towers and then pull them all apart. He’ll fill a base board with different blocks and see how they link up and how many he can fit on. Train tracks and threading toys are also great for this Schema, linking the tracks or carriages, threading bobbins/buttons on string is great for little minds to figure out. For Christmas all 3 of the boys are getting Tegu. It is a fab ethically made toy range of magnetic wooden blocks. The magnets are really strong, they repel and attract quite powerfully, which will be brilliant for all 3 of them. I can’t wait to give it to them. I embrace all my boy’s quirks, wants and desires, I let them lead me and I go with the flow. I’ve found this aspect of parenting actually the easiest. I make sure what they want to do is safe, obviously, and I occasionally I lead them in a slightly more productive direction but I don’t fight them. I don’t know if that’s a typical bloke thing though and it’s genuinely easier if the 3 of them believe it’s their idea … but it works for me. Unstructured play, plenty of open ended toys and I spend the entire day on the floor with them getting stuck in with whatever they want to do. So many fun ways for them to learn!